LaCie introduces a perfect companion for the Apple® Mac mini: the LaCie mini drive with up to 250GB capacity and either FireWire or USB interfaces. 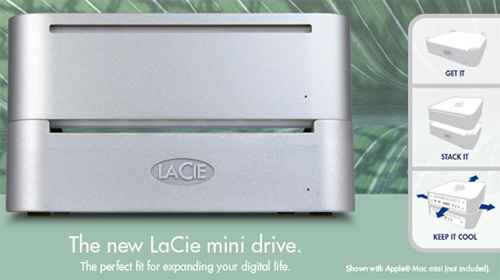 LaCie mini drive can be used to back up the Mac mini hard drive, add storage capacity, or easily transfer files to another computer with the same interface. Its unique four-corner crown fits exactly underneath Mac mini to create a stable, symbiotic harmony.